Atom interferometry team - Site de quantumengineering-tlse ! The atom interferometer team is interested in interferometry with Matter-wave. In particular, we have been developing atom interferometers with separated arms. These interferometers allow to set up controled perturbations on a single path. The high sensitivity of quantum interference patterns to these external perturbations can be exploited to measure weak external forces or internal atomic properties with high sensitivity. In particular, our experiments are designed to test the electromagnetic interactions, such as Atom polarisability, Atom-atom interactions, Atom-surface interaction, Atom neutrality. These measurements have applications in fundamental physics and atom metrology. We also study curiosity of quantum mechanics : Topological phase shift, decoherence and dephasing. Our previous studies on atom interferometry based on a lithium beam can be found here. Alexandre Gauguet, Baptiste Allard, Julien Alibert, Maxime Bordoux. 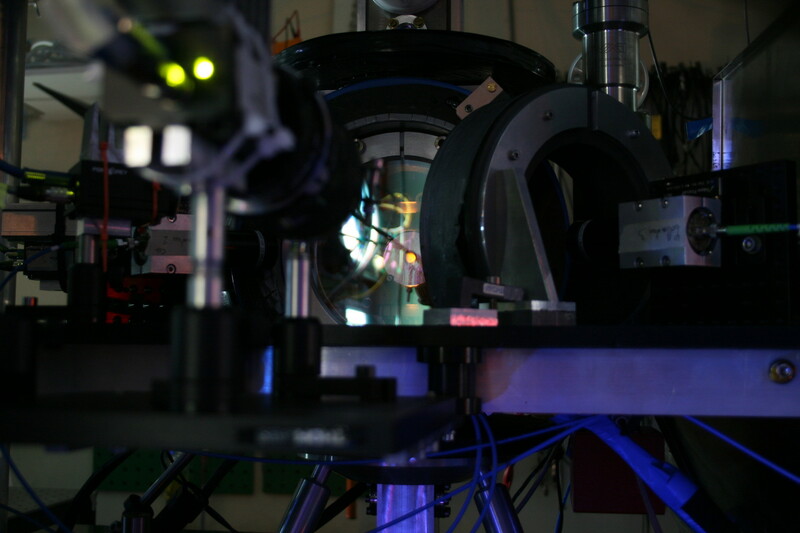 The new apparatus is based on an atomic fountain interferometer. 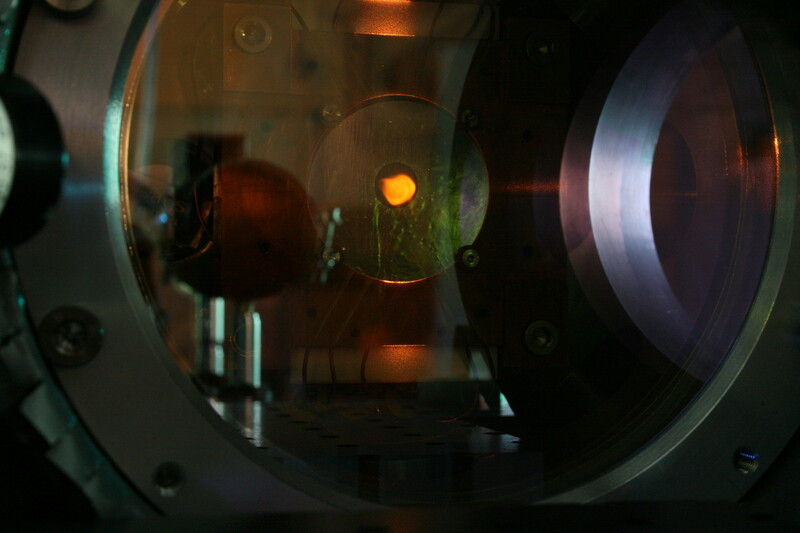 A sample of ultra-cold atoms (BEC) is prepared on an optical trap. The atoms are launched vertically with an initial velocity (≈ 2 m/s) using an optical lattice which transfers momenta of optical photons to the atoms. A sequence of laser pulses acts as beamsplitters and mirrors for the atoms, splitting the atom wave-function into a coherent superposition between two trajectories, and then recombining them in order to interfere. In our setup, we plan a large momentum transfer from an optical lattice to atoms leading to a large separation between the two paths of the interferometer. At the output of the interferometers the atom population oscillates according to the accumulated phase shift. The atom population is measured with the induced fluorescence emitted by the atoms in both outputs of the interferometer. One of the prospects in fundamental physics is to measure the electrical neutrality of matter. All experimental evidence to date indicates that atoms are electrically neutral (the electron and proton charge magnitudes are equal and that of neutron charge is zero) within a small error: 10-21 the elementary charge. The origin of the extremely fine tuning might be considered as a hint for new physics beyond the standard model. Indeed, the atom neutrality is strongly connected to the electric charge quantization. This remarkable property is a natural consequence in superstring models or grand unified groups, but also conventional extensions to the standard model could lead to charge quantization. On the contrary, some new theoritical models proposed dequantization of the electric charge either in the framework of extension to the SM or using assumptions beyond the SM. The measurement of the atom neutrality with an atom interferometer is based on the scalar Aharonov-Bohm effect. This effect consists in applying opposite electric potentials ±V on the two interferometer arms. These electric potentials are turned on only when the atom is inside the electrode assembly where the electric potential is constant and the electric field is cancelled, so that the atom does not feel any force. However, if the atom carries a non-zero electric charge, its electrostatic energy is modified and this modification gives rise to a phase shift proportional to the electric charge, to the applied voltage V and to the duration τ of the voltage pulse. To perform such an experiment it will be necessary to separate the atoms by several cm, in order to have clear separated interaction zones and long duration of the voltage pulse. The smallest measurable charge with our interferometer, depends on the sensitivity of the interferometer. This new method can potentially surpass by orders of magnitude below the current bounds. We are developping BEC source on a chip. The source combines on a chip, the magnetic trapping with microscopic wires and an optical dipole trap. It will also be possible to condense two isotopes of rubidium. This experiment will test new solutions in atom optics engineering which might have an impact in technological applications for transportable or on-board applications like inertial sensors and geodesy. With the hybrid solution, the atoms can be loaded efficiently in a pure optical trap by turning off carefully the magnetic field. 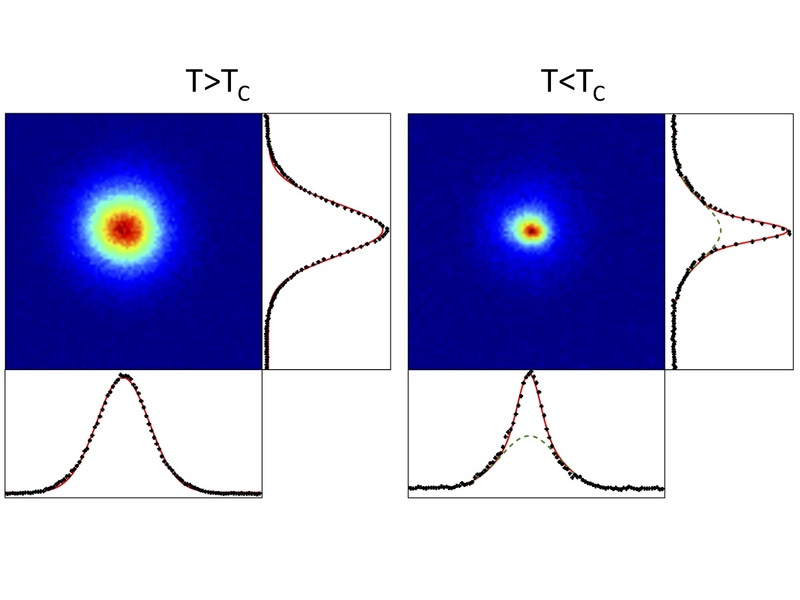 Because of the specific collisional properties of the 85Rb, a pure optical trap is essential to obtain a Bose Einstein condensate with this isotope. The strategy to get the dual-species BEC consists in finishing the cooling of the two rubidium isotopes in the same optical trap. The optical trap is also essential to avoid magnetic fields which could be harmful for precision measurements. Bose-Einstein condensate of rubidium atoms are obtained using an all-optical trap based on a crossed dipole trap generated by a 50W multi-mode fiber laser (1064 nm) and a 6 W dimple trap at 1560 nm. Pure BEC with more than 40 000 atoms are obtained every 5 seconds. We calculated the sensitivity function of a LMT-interferometers using sequential accelerating light pulses. The sensitivity to laser phase fluctuations is calculated, and we show that the pulse sequence can be engineered to mitigate the phase noise sensitivity. J. Phys. B: At. Mol. Opt. Phys. 52 (2019) 015003. 85Rb and 87Rb Mirror-MOT observed in the new vacuum Chamber ! 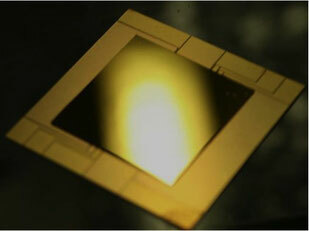 We load 5 billions cold atoms of rubidium 85 and 87 in a magneto-optical trap near the surface of an atom chip. Sina, Kessi, Maxime, Boris, Alex, Julien, Elise, Julien, Jean-Philippe, Gilles, Jacques.